The good news is that it is much easier than lots of candidates assume. Most of the times, it will be very clear from the beginning what the interviewer is looking for. Or in other words: you should know immediately whether it will be Leadership, Personal Impact or Entrepreneurial Drive. However, it might happen that an interviewer will ask you a much more specific question than one of the basic questions mentioned above. This is often the case when an interviewer reads about a challenging job, extra-curricular activity etc. in your cv, and assumes that you must have had challenging situations which would fit nicely for your personal experience interview. Therefore you should definitely review your latest items in your cv and think through which situations you could use for your PEI. Of course, your interviewer can always make it more difficult and include some twists and turns to make your PEI starting question more complex. Even though the starting question is different, the key issues will remain the same. So more often than not, the main thing you need to adapt in your examples is just how you frame the start (the „problem“), so that it also to the concrete question the interviewer is asking. And what should you do in case that you are not sure which dimension the interviewer wants to talk about? Simple answer – since your interview is not a one-way street, just ask the interviewer about the dimension. However, don’t phrase your question in a blunt way by simply asking something like “Which dimension exactly are you looking for?”, but rephrase your assumption/best guess in a way like “Did I understand correctly that you want me to talk about a situation in which I was leading a team through difficult situations along a project?” (referring to the Leadership dimension). 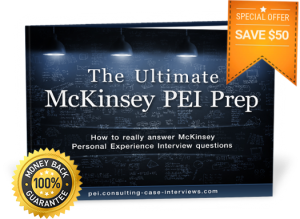 The Ultimate McKinsey PEI Prep eBook includes 20 different PEI starting questions which will give you more confidence, less stress and a proven way to have a solid start in your McKinsey Personal Experience Interview!